This is only a very few of the large number information sources about the Norse available over the internet. Loosely grouped by subject. Note that there is likely to be some duplication from the main Wareham Forge links page. An attempt has been made to ensure accurate information, but be aware that revisions to this page are only made on an irregular basis. 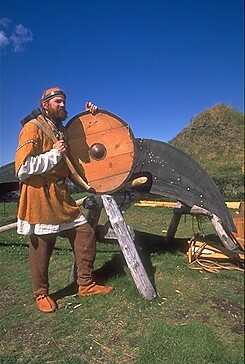 The World of the Norse was a major project undertaken from April to October 2003. This 1000 square foot exhibit was commissioned by the Cranbrook Institute of Science in Bloomfield Hills MI. It consisted of three realistic room settings containing about 175 individual replica objects that portray daily life in the Viking Age. It was installed to accompany the presentation there of Full Circle - First Contact, to better put the artifacts into living context. A separate sheet of information and links concerning upcoming museum events to mark the 1000 years since the Norse first traveled to Vinland can be found here. The official information guide by Parks Canada on the L' Anse aux Meadows MHS. In York, England the remains of the Viking Age city of York (Yorvik) were unearthed while constructing a shopping centre. Due to the waterlogged soil, a wealth of everyday objects of wood and leather were discovered. The Yorvik Centre displays this information. Despite the title, this series of articles details Norse clothing construction, from both a scholarly and practical viewpoint. Home page author is Carolyn Priest-Dorman. The work here is top notch, and represents the quality of work possible by 'serious amateurs'. Carolyn provided the 'Norse Textiles' section for the staff training manual for the Viking Encampment. This series of articles by Marc Carlson details construction and pattern of a large number of shoes based on a number of archaeological finds. About a dozen from the Norse and Anglo Saxon period (including the Oseberg shoes used in the Encampment). This set of information by Neil Peterson covers gaming and aspects of drink. Several solid articles. Neil was one of the interpreters for the 1996 demonstration of the Encampment at LAM. He also provided the research inot the rules for the Viking Game project. Neil is one of the driving members of our own Dark Ages Re-creation Company. An excellent collection of links to other related pages, including museums, academic sources and reenactment groups. 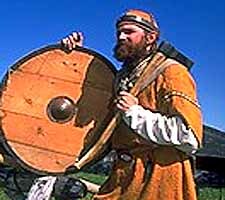 This site is operated by Past Forward, the company that markets 'the World of the Vikings' CD ROM. Regia Anglorum from England is perhaps the largest re-creation group centred on the Early Middle Ages. Not only excellent links, there is considerable information available here on a wide number of subjects. This group - who maintain two Viking ship reproductions, are located in the Maryland USA area. They have the full sized Fyrdraca (32 feet), as well as the smaller faering Gyrfalcon. The group is a special arm of the Markland Medieval Militia, a re-creation group centred on the Early Medieval Period. For the Longship Co.
Vikingbronze Index - Anders S�derberg. 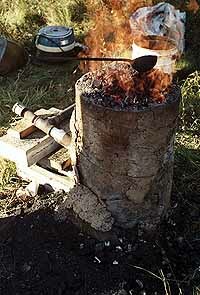 Viking Age Metal-casting. - Anders S�derberg. Fr�jel Gotlandica Viking Re-Enactment Society. This ongoing blog collection contains many shorter 'articles in progress' discussing aspects of both iron smelting and metalworking from the Viking Age, as well as topics of interest to historic re-enactors in general. A separate index is also available (updated quarterly).